Vista understands that typical parenting styles do not work with children with autism and other developmental disorders. As a result, we find that many parents feel powerless and lose confidence in their ability to parent effectively. They need enhanced parenting skills that are appropriate for their child. Vista’s Intensive Family Support Program provides ABA training, feedback, encouragement and strategic planning advice to parents. The goal is to continually build and strengthen positive behaviors and skills, propelling your family forward on the path to “normalized” lives. Vista’s Behavior Interventionists will work directly with your child to help him or her acquire age-appropriate life skills for use in the home, at school, and in community settings. Our goal is for your child eventually to reach the highest level of independence. With the right structured training, support and education, your pre-teen with autism can successfully transition into adolescence and then adulthood. Between the ages of 8-12, children start feeling a stronger need to gain acceptance from their peers. Children with Autism Spectrum Disorder are often excluded from sports and other recreational activities because they often find the social rules hard to understand and their peers find this lack of understanding difficult to accept. Consequently, your child often becomes isolated and is challenged emotionally and behaviorally. A successful transition from the pre-teen years to adolescence requires the acquisition of a variety of social and life skills, in order to effectively deal with these challenges. Your child will learn techniques to help him or her engage more effectively with his or her peers and gradually begin to realize that there are other children working through emotional challenges just like them. An essential component of this program is training for parents and other caregivers. We teach and coach parents on the principles of ABA and how to apply them to behavior deficits and challenging behaviors, to supplement the formal training that Vista provides for the child. Vista offers a parent education program in which we teach families the fundamentals of ABA and how they can be applied to the training of needed skills and the reduction of challenging behaviors. A highly qualified instructor will teach you the background, terminology, and basic strategies of ABA, and you will have the opportunity to communicate with other families who have a similar life experience caring for a loved one on the autism spectrum. This course is available in the North Los Angeles area at this time and it will satisfy the regional center requirement of parent education prior to the implementation of in-home behavior services. 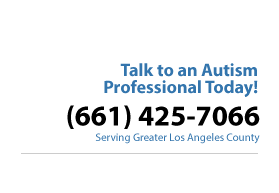 Our in-home ABA services, which are available throughout much of Los Angeles County, focus on directly training your child, as well as training and support for parents and other caregivers. In comparison to our program for younger children, our program for pre-teens provides more intensive training for parents and other caregivers, like nannys, grandparents, aunts, uncles and older siblings. We train parents and other caregivers on the principles and procedures of the science of ABA. In addition to seeing your child make gains in learning and development, you as the parent will acquire the skills to confidently maintain and extend this progress with your child. Vista provides a leading edge approach for treating autism and other developmental disabilities. Our goal is not only to maximize the potential of children, teens, young adults and adults with autism, but to improve the lives of their families as a whole.